Prevent destructive facing and discoloration of important documents with Exposures Taylor Conservation Document Frames. Made with the same technology trusted by top art museums to protect their artworks, this photo frame has innovative UV-blocking glass and a Microchamber® liner for document protection. A black wood finish and brushed nickel border make this document frame a perfect fit in any room. 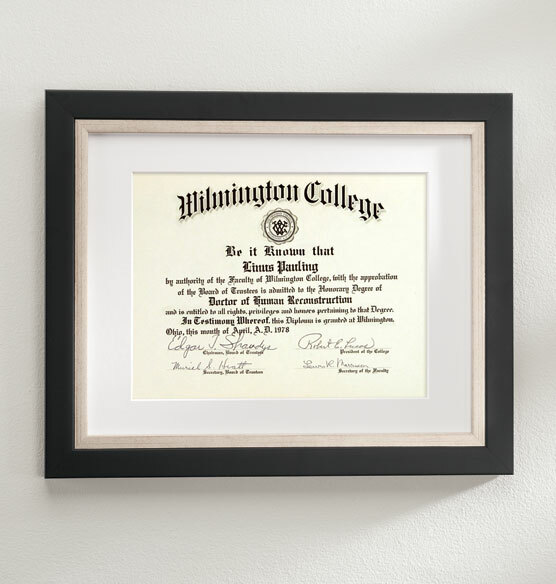 Hang a diploma, certificate or other document on any wall, while keeping it safe from environmental degradation and harmful UV rays. I have a diploma to frame. Nice frame for my diploma. What size document is this frame designed to display please? BEST ANSWER: Thank you for your question. It measures 13 1/2" wide by 16 1/2" high overall, most certificates and diplomas will fit in this frame. We hope this information will be of help to you. Thank you for your question. The frame will hold a 8 1/2 x 11 document. We hope this information will be of help to you. Does it fit a 8x10 certificate? BEST ANSWER: Thank you for your question. Yes, an 8x10 certificate will fit in this frame. We hope this information will be of help to you. Apparently the mat is already cut. What are the dimensions of the opening in the mat? BEST ANSWER: Thank you for your question. The opening is 10 ¼” X 7 ¾”. We hope this information will be of help to you.